Predoctoral student Jonathan Calvert, background, is monitoring the muscle activity, joint angles and foot pressure of the research participant while he is attempting to perform an overground stepping task. The research team includes, from left, physical therapist Megan Gill, and kinesiologists Dan Veith and Margaux Linde. 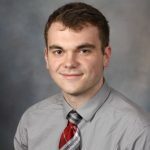 As a predoctoral student in the Mayo Clinic Graduate School of Biomedical Sciences, I’ve had the opportunity to work on a project investigating the use of epidural electrical stimulation and intense physical therapy to help people with chronic paralysis regain movement following spinal cord injury. In a recent article in Nature Medicine, our team, led by Kendall Lee, M.D., Ph.D., and Kristin Zhao, Ph.D., demonstrated the ability of epidural stimulation, combined with rehabilitation, to restore independent stepping ability in a man who was paralyzed. Diagnosed as having a motor complete injury, the man was unable to move or feel anything below the level of his injury. 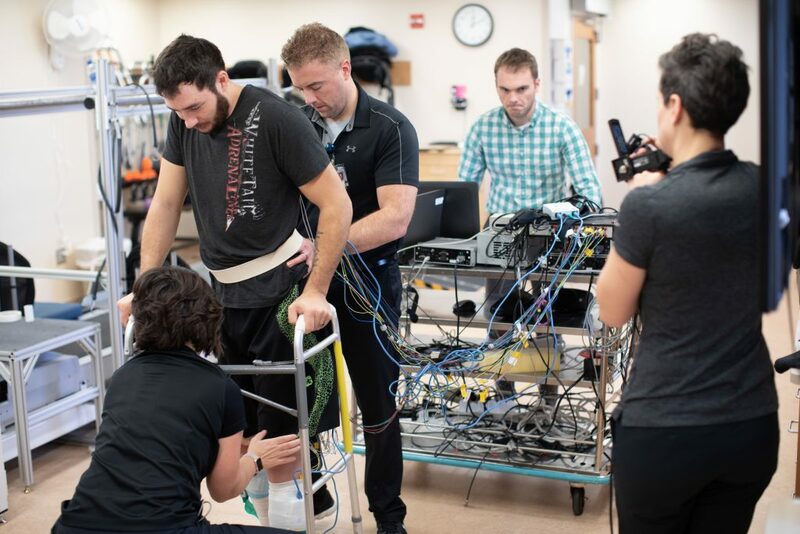 With epidural stimulation and physical therapy, he was able to walk over ground using a front-wheeled walker and step on a treadmill placing his arms on support bars to help with balance. Our results, along with recent results from other researchers working in the same field, have demonstrated that this technology has potential to possibly restore motor, cardiovascular and autonomic function in individuals with a spinal cord injury. To move this technology forward, so our results can be verified by other researchers and this research technique can be used at other centers, we recently published a paper in Journal of Neurotrauma detailing the intraoperative techniques used to place the epidural electrode array in the optimal location of the spinal cord. The ideal electrode location was achieved by placing electromyography (EMG) sensors on the leg muscles of our research participants in the operating room. By stimulating different areas of the spinal cord, we detected and quantified leg muscle contractions. These responses were displayed real-time on a computer screen during surgery. I used those responses to help guide Dr. Lee — my mentor and Mayo Clinic neurosurgeon — in placing the epidural electrode array to achieve maximal responses. Assisting with placement of a device that could have such dramatic outcomes was an incredible feeling. After recovery from surgery for three weeks, the patients were brought back to the laboratory where we electrically stimulated their spinal cords using the same electrode configurations and parameters we used in the operating room. We found similar motor responses, indicating that the electrode array did not significantly change position during surgical recovery. Additionally, when we turned on the epidural stimulator, both patients were able to move their legs intentionally while lying on their side within five days of surgery. Being able to witness such results first hand has been gratifying, and I feel privileged every day when I get to go to work with this team. It is my hope that these promising results will provide optimism for those suffering from chronic paralysis and with continued research that there is a solution on the horizon. 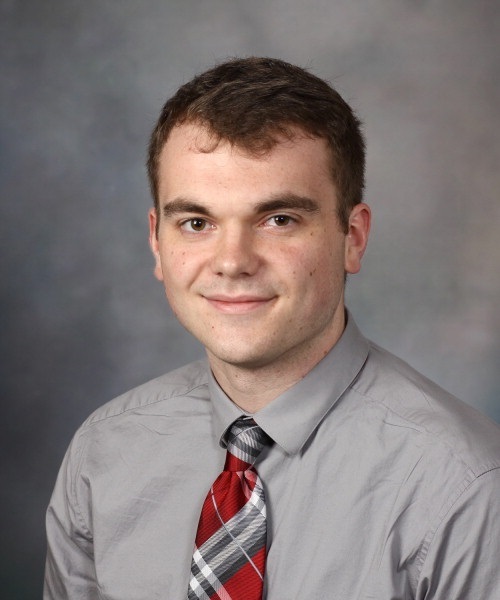 Jonathan Calvert is a predoctoral student in the Mayo Clinic Graduate School of Biomedical Sciences, which is one of the schools of higher education within the Mayo Clinic College of Medicine and Science. What an incredible breakthrough for paralyzed patients.